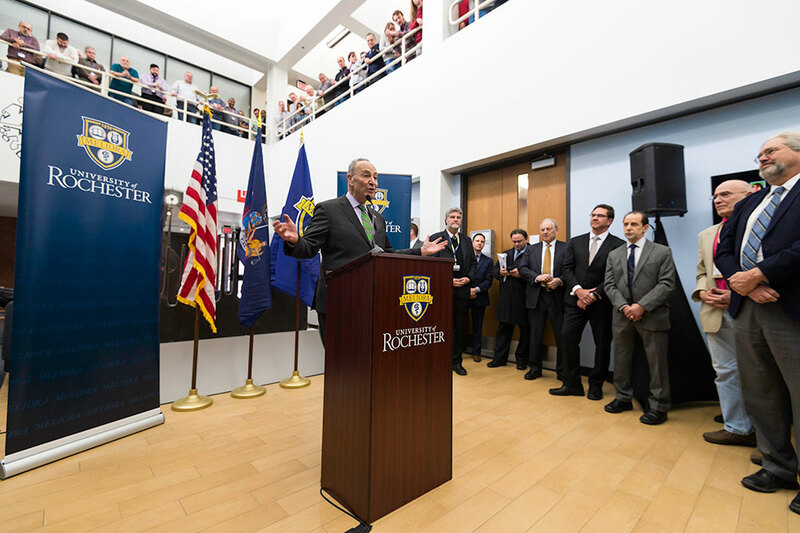 U.S. Senate Minority Leader Charles Schumer announced a three-part plan to protect and expand the University of Rochester’s Laboratory for Laser Energetics (LLE) during his visit to the LLE on Monday, March 5. The Trump Administration’s Fiscal Year 2019 budget, announced last month, proposed significant cuts to the lab and a “three-year ramp-down” in federal support. During his visit, Schumer praised the LLE for creating jobs and advancing scientific research in physics, optics, and photonics. Schumer’s three-part plan to protect the Lab includes: calling on Congress to include $75 million in federal funding for the LLE in the Fiscal Year 2018 spending bill; asking the Department of Energy to approve a new five-year cooperative agreement between the U.S. Department of Energy’s National Nuclear Security Administration (NNSA) and the LLE; and inviting NNSA Administrator Lisa Gordon-Hagerty to tour the LLE’s OMEGA Laser Facility. “Turning out the lights on the laser lab is a horrible idea, and I promise you, it will not happen under my watch,” Schumer said.